What a fabulous story! Cold and twisted and, at times, very close to being too graphic with its grisly details; this book had me hooked right from the start! It is right up my street in terms of the way it messed with my head and is extremely well-written to boot. I loved it, especially the wonderful twist at the end that I was nowhere near guessing. 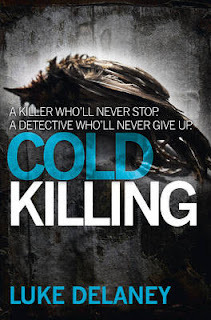 COLD KILLING is Luke Delaney’s debut novel and, if this is a sign of things to come from him, as I am sure it is, then he is definitely a name to watch out for. Delaney’s years of experience in the Met murder squad are very obvious. His writing has an authentic ring to it and his main characters are all extremely scary people – even the good guy! To give you a taste, the book is the first in a series featuring DI Sean Corrigan, who has an uncanny knack of being able to catch killers by empathizing with them. The product of an abusive childhood, he is haunted by his own memories and sometimes sails very close to the wind in terms of losing it himself. At a murder scene he is able to think like the killer and sees things that nobody else does. In this book he is shocked to discover that the murderer is extremely adept at leaving no traces of himself on the bodies of his victims. There is no link between the victims, and no apparent motives for the killings, yet Sean has a hunch that they are all the work of the same person and knows who this person is. All he has to do is prove it. Despite annoying several rather influential people, Sean continues with his search, getting closer to the killer but all the while knowing that his man is always a few steps ahead of him. Chapters detailing Sean’s chase are interspersed with others written from the killer’s point of view; both his actions and his private thoughts. He is a cold and evil man, who truly believes he is superior to the people around him, including his wife and child who unwittingly help him maintain the farce being a decent, family man. He laughs at the police, as they think they are getting closer to catching him, and greatly enjoys leading them a merry dance across London. If you like your crime fiction dark and twisted, and sometimes a little too twisted to be completely comfortable, then this book is most definitely for you! Read another Euro Crime review of Cold Killing.